You will receive 93 pages of printables, PowerPoints, student booklet pages, and graphic organizers that will help your students recognize and distinguish between different shape attributes. 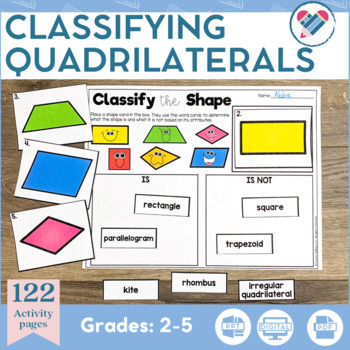 There are hands-on, engaging activities that will keep your students motivated as they learn about classifying quadrilaterals. 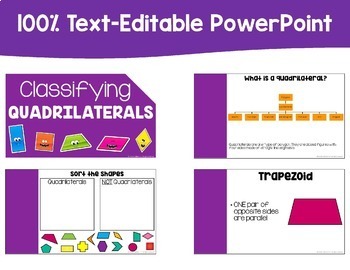 • An interactive PowerPoint (that is 100% text-editable) and student booklet to help solidify student understanding. • Building shape pages to get your kids working with each shape closely. 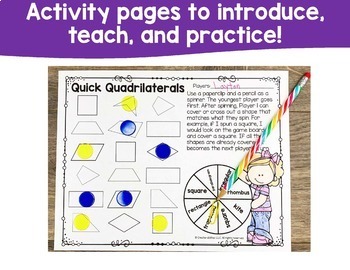 • Quadrilateral craftivities to help students show what they know! 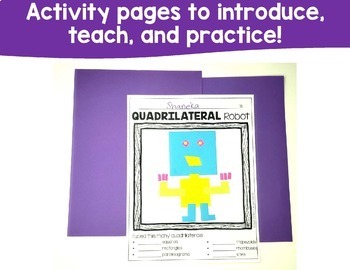 • Quadrilateral pages to help introduce, teach, and practice quadrilaterals and their shape attributes. • Venn Diagram: A Venn diagram is a great way for students to discover differences and similarities between two quadrilaterals. Put the shape names in the rectangles at the top of the page so students will remember which two shapes they are comparing and contrasting. • Name That Polygon: Students often don’t realize that one shape can be called by many different names. The Name That Polygon page helps your students see the many different names of three quadrilaterals. • Circle It: Students look at a given shape and circle all of the names that shape may have. For example, a square could be a parallelogram, a rhombus, etc. • Shape Pages: Shape Pages cover the regular quadrilaterals. They will give your students the opportunity to define, draw and illustrate the different shapes in their own words. They are powerful tools in developing a deeper understanding. There is also a blank page to use for irregular quadrilaterals or other polygons. The assessment is a great way to check for understanding. A key is provided for easy grading.